What is “Home Staging” and How You Can Make Money Offering It Too! If you want to make extra money by shedding new light on how to promote a home in the real estate marketplace so that it will sell faster and at a higher price, then you should consider adding "home staging" to your services. I touched on home staging, sometimes also called "house fluffing" or "ready to sell" in my eBook "Rearrange It". But I decided to address the issue again and in some detail here. In past years, as you might well know, homeowners were left to their own instincts and decorating abilities as far as preparing their homes for market. Many of them would ask their real estate agent for advice, but that was too often "the blind leading the blind". Real estate agents are trained in the area of promoting your home and making and accepting offers and handling all the legal and financial paperwork involved, including escrow. They are not trained in interior design. They might have an ideas as to what factors can help sell a home, but they will be really basic. Here is a very real need that homesellers have and so an entire industry has grown up around providing an answer - home staging. This is what professional home stagers are trained to do. A good home stager will work with the “flow” of a home, tidy it up, eliminate clutter, rearrange furniture and accessories, and give ideas to enhance the home's curb-appeal. Any house can make a notable first impression on potential homebuyers with the aid of a professional home stager - YOU. The first impression is the key factor in selling your home, which any good real estate agent will confirm. Unbelievably as it may seem, a potential buyer has made up their mind ten seconds after they step in the front door, in most cases. Just driving into your driveway, they have formed an opinion. They will spend the rest of the time confirming that opinion. So your client's home better look good from the curb - and that's where you come in! Your clients will find you in the same manner they would find an interior designer or a landscaper. They will ask around. They will get referrals. They will ask their real estate agent. A number of larger real estate companies now offer access to a list of professional stagers in their area. They have often already been pre-screened, so you will want to make sure you get added to their list. Your prospect will always ask for an estimate. Give a complimentary estimate and you'll probably get hired if you structure the estimate fairly and cite plenty of benefits to the homeowner. Keep in mind that this is only an estimate and estimates can be a bit off. However, unless something unforeseen takes place between the estimate and the actual job itself, an estimate should be fairly accurate. You will no doubt feel a little uneasy at first, but you'll get better at estimating when you have a few projects under your belt. Don't be surprised if the home-seller gets more than one estimate. Just like any service, pricing in the home staging industry can vary over a wide range, sometimes escalating simply because of locale. You may want to charge an hourly rate. Factors to consider are the average amount of time you expect the home to be on the market in your area, and the asking price of your prospect's home. The homeowner should be willing to pay for staging services in accordance with the asking price of the home. If you bring in rented furniture and accessories, the price will be considerably higher. Remember, if you charge too much you will make it unrealistic for the homeowner to benefit. Don't forget that the average seller plans to move OUT of the home in the near future, the sooner the better. Don't lose sight of that. They will be reluctant to invest a huge amount into a home they are selling, no matter what the asking price. Know in advance what your costs will be. Anticipate a reasonable increase in price based on your services. The rule of thumb is that the higher the asking price, the higher your fee - but it still has to be reasonable. Some agents will be willing to share in the cost, because it is to their advantage to make a quicker, more profitable sale. They will be analyzing their profit margins. They will want to weight the cost of staging with their costs of advertising the property. Experienced agents will have a good feel for those homes that are in need of a staging service. A home that has nothing in it, where the seller has already moved out, is a prime candidate for a staging service. A agent should value the homeowner’s best interest. Many of them have an amount set aside in their marketing budget for staging services already. If you're good and your services are reasonable, they will want to enlist your help. Everyone wins. The goal is a speedy sale at the best possible price. Staging is certainly a viable way to achieve just that. Take a close look at the home's condition before you make recommendations. Tell the seller that you usually only have one shot at impressing potential buyers so the decisions need to be made carefully. Clean the over and any other major appliances thoroughly. If you don't want to do it, hire a cleaning service. Everything from floors to windows to skylights must be squeaky clean and crystal bright. Odors can be very offensive - kill them thoroughly. You might not see a spot, but you sure will pick up on any smells. Eliminate clutter - eliminate clutter - eliminate clutter. No one will be attracted to a messy place. Put away everything from counter tops that is utilitarian. Leave out only a few decorative items in the kitchen. It should appear clean as a whistle. Remove all family photographs. The home should not reflect the sellers. Organize the closets thoroughly. They will get opened. Clean the drain gutters completely. You don't want anything outside or inside to suggest that there might be hidden maintenance issues. Store anything and everything that makes the place look messy - both inside and outside. The front entry should be the most appealing room in the home. Decorate it, paint the door or have the client purchase a new door. Remember, first impressions are everything. Have you ever walked into an empty space and been blasted with stale or mildew-laden air? Rid the home of any and all mildew before it is ever put on the market. To reduce odors, have the owner leave the heat or air conditioning on all the time. It helps to circulate the air, keeping it fresh. In cold weather, you don't want the home to feel colder inside than outside. This is a turn off to potential buyers. Hire someone to take care of the yards if you need to. Build this into your estimate. Warn the seller not to take the changes personally. They must separate themselves from the personal endearments they have about the house -- it's merely a possession that is to be sold. Get rid of anything that is too colorful, too busy, too far away from neutral tones. Trust your instincts. When you first arrive at the home, look at it as if you were a potential buyer. Potential buyers try to visualize themselves living in the space, putting in their furnishings, and so forth. The more neutral the environment, the easier it will be for them to do that. Ask yourself, what would you think about the house? Where can you make an immediate change? Where can you make any free changes? Look for the home's best features and try to focus on them - to make them stand out more. Don't make the space too sterile - it still should have some personality and look lived in. Are there ways you can create a mood? Coastal homes might look great with breezy, sheer fabrics on the windows, blowing in the wind. However, that wouldn't feel right for a mountain cabin with rustic wood walls and a heavy stone fireplace. Don't jump right in. Take time to gather ideas. Talk to friends and family. Let ideas germinate and trigger other ideas. Put all the family photos in a box. You want the buyers to imaging themselves living in the home. They might not like the looks of the sellers and never get past that. A contract is on it's way to being signed when the prospects start talking about where they could put their own possessions. Remove anything that is a collectible item or that draws a lot of attention. You don't want the prospects to get sidetracked by the possessions and not look at the house. Eliminate some of the furniture to make the home look more spacious. Clean and organize the shelves, entertainment centers, closets, laundry rooms, cabinets. Store all boxes in the garage - or better yet - in a storage facility. It's really nice to walk into a clean and spacious garage. Show the hardwood floors, if they are beautiful, by removing all area rugs. If there are heavy drapes that block the light, remove them. You want as much natural light to come in as possible. And there just might be a great view that is being blocked out. Remove all artificial plants and bring in real plants that are healthy. Plants will really make the home look spectacular. It's amazing what a difference a coat of paint will make. If the walls are dark and dingy, paint them a light neutral color. It will help make the room seem bigger and definitely make it appear clean. What a great fragrance - fresh bread or a cake or pie. Be sure to have some on hand for every showing. Choose some background music that flows with the mood and style of the home. Know in advance, if possible, the age range of the prospective buyers. Don't play rap music for senior citizens. It's not just a matter of mowing the lawn. Look for other things you can do to make the front yard neat and appealing. Many people will do a drive by in the evening after work. Place solar lights around the front yard. They create a great mood and help give them a better idea of the home and neighborhood after dark. Make sure the front door has a good, quality door knob set with good security. Clean the driveway. Clean all debris, oil stains or marks. Have it steam cleaned if necessary. A buyer might be more lenient about minor repairs that may be required if you have made a great first impression. You want them to fall in love with the house as soon as they see it from the street. Be careful about your early expenses because you do not want to overstep your budget. That will cut in to your profits. It's difficult to look at your own house in the same way that potential home buyers do. Understand that your sellers will feel that way too. Be sure to prepare them for changes. Be sure to tell them that the changes you make are NOT a reflection on their taste, but strictly made to appeal to a broad number of people. Get them to open their eyes and stop thinking of the property as a home. It's a house - a space — a mere commodity you want to sell for the highest dollar possible. Before you ever approach the home, park on the other side of the street and just study it. Then ask yourself these questions. Are you viewing the property from the same position as a home buyer who is doing a drive-by? If you were thinking of buying the home, what kind of impression would it give you? Are there any exterior features that you can enhance? Are there any exterior features that should be minimized or improved? Now walk towards the house just the same way a would-be buyer would walk. Check out the pathway. It it clean and well-kept? Begin a list of areas that are great and areas that need improvement. Get a digital camera so that you can take and view instant pictures. After you have previewed them in color, switch your camera to black and white. This will help you see things you might overlook because of the effects of color. Do Not Discount Evening Appeal Just before dark, do this exercise again. The seller's home may get more drive by visitors in the evening than at any other time. So you'll want to make sure the home has evening curb appeal. Get some low voltage lighting and string it along the drive way, sidewalks, and around landscaping elements. If the budget will allow it, add a decorative street lamp or an attractive light fixture to the exterior entry. I love my many solar lights. They are very inexpensive and easy to stick in the ground. A home stager should acquire several sets that can be "loaned" to the homeowner until the house sells. Have the seller open the drapes, shades, blinds in the evening to let interior light out. This makes a very appealing sight for a drive by prospect. If I were doing a drive-by, I'd want to get a peek at the back yard too. Most people will try. So if it is at all visible from another street or a neighbor's driveway, make sure you eliminate anything from view that is not pleasing to the eye. Kill mold wherever it exists. Check the sidewalk, roof, patio and inside the house. Put away those unsightly garden equipment and tools. Check and clean the gutters and all windows. Use pressure washing for those dirty siding and dingy decks. Sweep and clean the sidewalk and all paths. Remove weeds as much as possible, especially those between cracks, stone or bricks. Keep the lawn neatly mowed and edged. Even if the lot is wooded, rake the leaves and toss them out. Make sure no tree limbs are near or touching the roof. Make sure the chimneys are clean and free of debris. Sometimes it's not what you add that is important, it's what you take away. Here's an example - A homeowner had several large trees in the front yard. One was so full, the branches were being weighed down and it looked sightly. On top of that, it was eating up the asphalt driveway. It was suggested that the trees be completely removed, including the roots. The homeowner had the trees cut down, but could not afford to have the stumps and roots removed. They did replace the driveway with concrete. I took the stumps and used them as shelves. I built up the dirt around the stumps, planted flowers around the perimeter and placed a large potted plant on each stump. I cannot tell you the number of people who stopped, as they were driving by, to say how much they loved the new look. It is difficult for buyers to visualize making changes to a home. If they don't like what they see, they move on to the next home on the list. And if they can look past things they want to change, they expect to buy the house for a reduced price to make up for that. This is not good for your seller. This is why it is so important to make the exterior and the interior as generic as possible. Never lose sight of the fact that buyers don't want to replace anything and they don't want to fix anything. So the more you can get your home-seller to make the necessary the revisions, alterations and changes, the better off they will be. Popular colors change from year to year. If the house is old and dingy, a fresh coat of exterior paint will really make a difference. If not sure what colors to use, drive the neighborhood and pick out homes that have an appealing color. I once went up to a homeowner and asked what colors she used on her home. She was more than happy to give me the information and felt complimented at the same time. New front doors can be very expensive. If the budget will allow, it's not a back investment. However, if the budget will not permit a replacement door, put on new hardware that is decorative as well as securely built. If that is not possible, how about repainting or staining the door and polishing the hardware? I've said before that it's really important to get your business known in your community. Complimentary publicity is one of the best ways to do that. The difference between publicity and advertising is not just in the price tag: one is complimentary, the other one isn't. But publicity acts like a third party recommendation, and readers are known to respond far better to publicity than to advertisements. We're going to discuss some methods of getting publicity that you don't have to pay for with some more unusual tactics. Throw some of these ideas into your marketing procedures and see what happens. If you were a reporter and every day you had to hunt for a story or article, don't you think you'd like a little help from time to time? Where does a reporter go to find a story? Where do they find people? Send a brief notice to your local TV or radio station and tell them that you know a little about a certain topic and that if they are ever in a hard spot to find someone to interview on that topic after they have called around, to give you a call. Ask them to put in in their rolodex. Most media people have a rolodex of local experts. You can telephone them or send them a letter. Just call the reporter up and tell him/her you are an expert in this area and you would welcome any questions the reporter might have for you. Would you like to be on the lists of experts that media people reference every day from all over the country? These lists are called "Publicity Referral Services". One such referral service is the RTIR Magazine, otherwise known as Radio-TV Interview Report. You can find the online version at http://www.RTIR.com. These are all people who can be contacted for interviews for all kinds of media on the topic of their expertise. By becoming a member (there is a fee), you can start getting media calls requesting interviews. It's easy and it works. Some of the NY Times bestselling authors use this service. There are even meetings that you can pay to attend that will introduce you to media producers and editors at the highest levels? RTIR sponsors these types of events too. Think of it as a publicity networking meeting. These top media people, producers and directors, are there to meet new people and hear your story. While they are pretty expensive to attend, whole careers and businesses have been launched by just one good contact. As I am writing this, a National Publicity Summit is being conducted in New York City on July 14-17. For more information, visit www.NationalPublicitySummit.com. Redecorate Your Home Using What You Already Own! Newly Revised! Redecorate Just Like a Designer, Using the Furnishings You Already Own! - NEW REVISED TRAINING! Barbara Jennings will answer trainee's questions personally for free when you write. Become a High Paid Art Consultant! Have fun designing decorative art programs for businesses. Work from your home by appointment and work when you want. It's an easy business to learn and very creative too. If you love art, or are an artist already, this business is perfect for you. Hang out with CEOs and executives looking for art for their offices. Join the lucrative and prestigious ranks of art consultants. No experience necessary and full and complete training provided. "Hi Barbara, I finished reading your books and felt ready to tackle my first redesign. Imagine my dilemma when I arrived to find a room with every large piece of furniture in the right place!!! Luckily this was a friend's mother that I had offered to do for free to acquire some before and after pictures. The only thing I could offer was to rearrange some of the accessories and pictures. That experience made me worrying about handling that in the future with a paying customer. I know that a lot of the time there is more than one way to arrange the room. With this room and available furniture however, I could not see any other successful arrangement. Would I just congratulate them on their wonderful room or lower my price and offer to rearrange small items and pictures if appropriate? I'm sure you must have experienced this. I have a background in furniture display for a large retail store and have taken interior design courses in the past so I don't think it was just a lack of experience on my part. - Thank you, Paula"
This is a case where you asked someone you know to help you out, and it turned out that the person didn't need much help. That is a very different scenario from someone who responds to your service who is willing to pay. People who have a good sense of design, while not perfect, aren't going to be willing to pay someone to come. So they're going to kind of weed themselves out automatically. If you ask enough questions over the phone and screen them properly, you'll never encounter such a problem. I'm just now this minute dealing with a woman in my town and screening her thru email. I'm attaching a copy below of some of the questions I am asking her before I will even talk to her. Hopefully this will give you an idea of how I go about making sure on the front end that this is a person I can truely help or not. Remember, it's your business and you can do whatever you like. The client will be happy and you'll get referrals so long as you make them happy! I have a few more questions. There is no right or wrong answer, I'm just trying to get a good feel for the situation to make sure I can make it really worthwhile for you. give me a description similar to the above that you feel best describes your situation. Are you willing to let us move furnishings from one room to another, besides what you already mentioned below? Do you have any furnishings stored in the garage that could be considered and brought in to help out? Do you have any plants (table plants, floor plants, trees) that can be used: lots, few, none? What is your home's square footage and when was it built? Anything else you can tell me will be helpful. "Hi Barbara, hope your weekend is going well. I am working on my "superplan" and seeking some help on what to charge. ... I started a faux finishing business after losing my corporate job, but am seeking to move into redesign. One of the things that drives me absolutely NUTS about doing faux is that it doesn't take much for you to lose your profit -- a late or incorrect delivery of your product causing a day you thought you'd work and don't, a mis-communication with a client, issues with drying times, etc., all can work against you. On top of that is the issue of pricing one's work. I have spoken with ... but I really think she doesn't charge enough. In the past I found it tough to price my faux work, although I have come a long way! I believe underbidding is a common problem for most artists. I want to be sure I do not make pricing mistakes in moving into redesign. So far, in calling redesigners in my area (San Diego), I have found (so far) either Scenario A: a $75 consultation where no work is done at the consultation, but where one then is given pricing beyond that time, once client and designer have exhanged info about needs and desires for the project. I have also heard of Scenario B: the consultation really is a "working consultation", and carries an hourly rate of either $75 to $90 per hour, with the ability at the end of that consult time to either go forward on one's own, with a list of "to do's" given to the client, or continue on an hourly basis, down the road, with the designer. I would prefer (as you mentioned in your "Rearrange It" product) to charge a flat rate for my time, and not get into hourly situations. That way I know, by the end of the day, what I'll be bringing home, barring any extreme unforseen circumstances. I know that rate will vary perhaps with the distance I might choose to travel, or with the size of the room(s) to be addressed. So......two questions for you, if I may. Is there any way you might feel comfortable in sharing what you charge? Or at least a general range? I realize you are in Orange County, but we're not that far away. Also, would you ever consider allowing me to pay you for the privilege of accompanying/helping you and your assistant(s) on a makeover appointment? While I get a lot of orders, I most certainly remember they really nice ones . . . You'll be happy to know I thought of you as one of the nicest. I charge a flat rate of $350 for a half day, $600 for a full day. amount of art, plants, family photos, accessories, etc. What I'm looking to find out first and foremost is whether the prospect has tons of stuff for me to work with, a generous amount of stuff, or rather skimpy stuff - to put it bluntly. I know I can pull some rooms together in an hour and other rooms will take 3 hours or more. So I explain all of this to them. I tell them that if their room goes together fast, we will then move to another room or take a look at the whole house so I can give ideas and direction in other areas to fill out the time, so that I'm literally there for about 4 hours for that flat rate. Now competition will be less, some a little more. What you have to decide is whether you're "worth" what you charge and whether you're willing to take less just to get the job. I'm no longer at that point. My attitude is that if you don't want me for what I want to get from it, then I'd just as soon stay in my office and advance my web business. I have even been known to talk people out of hiring me and getting Decor Secrets instead. So you're not going to be able to use me as a fair comparison, I'm afraid. My advice? Don't worry about the profit margin when you first start out. More important to concentrate on the fact that you are building experience, expertise, photos for a portfolio. Heck, were I in your shoes, I'd do some for free and not blink twice. In fact, that is almost exactly how I started out. Believe me, you take far more away from a project than just cash in your pocket!!! Capish? Down the road, weed out the looky loos and the low income people - they aren't your target market anyway. I only did one project by the hour and the woman kept looking at her watch and saying, "Can we hurry this along?" That was the only time I worked by the hour. I don't like to be pressured and some of the time I just need to stand and look at a room and think before I move. While I'm actively working, it doesn't appear so, so if charging by the hour they get antsy. Do a great job on the front end qualifing your prospect and you'll be better able to make your quotes realistic. Always mention contingencies that can happen in your faux biz and how that might affect the end price. I have found that when you let people know on the front end what can go wrong, what can increase the price, etc. they are pretty cool about paying for it if that happens. If you don't address it on the front end, good luck getting a higher price out of them at the end. Don't lock in on one single flat rate. Give them a range: $250-350. Then tell them that most people fall in at about $300. That way you appear competitive with the low ballers yet you build in a safe guard in case things don't move as smoothly as you anticipated. Then you can tell them it will be not less than $250 and not more than $350, unless you have to come back another time, or something like that. Always have Plan A and Plan B. Always have something else equally important that will advance your business as a backup in case an appointment gets cancelled or postponed. Then you won't mind so much when it happens. I kept my life very simple. I didn't do anything but rearrange furniture and accessories. So that way I always completed a project the same day. My time was far to valuable for the one hour consult and nothing more. But I have a friend in the biz in TN who schedules all her one hour consults for Monday, then if she can turn any into a full fledged redesign, she books them thru the rest of the week. Of course, everything is easy on paper, so be flexible. Why don't you stop in at your local Home Depot or other home improvement store and get them to use you as a faux painting class teacher. They promote your class and sign up the students, you teach the class. Weave your redesign expertise into your class. This way you'll have a steady stream of people looking to you for your expertise and if you handle it right, they'll practically beg you to consult with them, instead of the other way around. Lastly, when you quote your faux painting to some, stress that you are an artist, not a painter. Tell them up front that they might find other people low balling their price or who are not artists. Then ask them if they want an artist to render a beautiful wall that they will be proud to show off, or a handyman who might just throw it together. Remind them that they usually get what they pay for, and in faux painting the saying is really true. Stress the benefits of hiring you. Stress how you are better than, different than others. Stress how much you care: before, during, after. Tell them that you build your business with referrals you get from satisfied clients, and that you will make doubly sure they are totally satisfied with your work. In other words, give them a risk free guarantee. This is just good marketing and should set you apart from the competition. 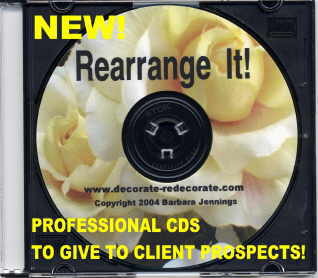 We'll Help You Get Clients Using Our Professional CD Slideshow! Get Started Immediately the Easy Way! Ever hear the saying, "A picture is worth a thousand words"? Well, there's a reason. 95% of people are visual learners. They need to see what it is you're presenting to them. When they can see it, they understand it better and get emotionally involved in the process. That's why it's so important, in a decorating business, that your client prospects be able to "see" and "experience" the benefits that a room makeover will bring them. And up until now there hasn't been any way made available to new entrepreneurs to do that quickly and effectively. This has scared many people away from even trying to start their own decorating business. SEE FOR YOURSELF: Version 2004 of Corey Rudl's best-selling "Insider Secrets to Marketing Your Business on the Internet"! >> How to build your very own Internet business in the next 48 hours! >> How to build a top-selling web site... for less than $100! >> Where to find hot products (in 20 minutes or LESS!) that you can start selling TODAY! >> 100s of FREE and cheap online tools, resources, and software that you can use to automate your web site! >> How to get #1 rankings in the search engines and get tons of FREE traffic from the "Big Guys" like Google! >> Secrets to writing salescopy that increases sales by 400% (or MORE)! >> Getting 1,000s of NEW visitors to your web site... FREE. ... and that's just the tip of the iceberg!